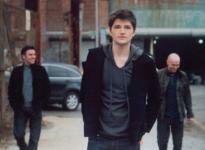 2008 was a great year for The Script: three chart-topping singles, a World Music Award and a number one debut in the UK album charts. Now, with all this success under their belt and an impending fourth single, it’s clear to see that 'Talk You Down' is craving mirrored achievement. With nothing but a few piano chords and the voice of Danny O’Donoghue to the opening, the single teases its audience as the melodious and smooth beginning branches out into a passionate and upbeat composition. Creating an opus through a satisfying combination of drums, piano and guitar they easily build momentum and send us in to pop/rock overdrive. Lyrically the trio excite their niche, captivating them through a narrative strong enough to stand alone as they sing about ‘relationship suicide’ – a great metaphor by anyone’s admission. As the track unfolds and the rhythm establishes itself, emotions run high as a tale of love, loss and a desperate yearn to never be apart is unmistakable. When you listen to the track it’s suggestible that this release might not break any musical obstructions, but then why change something so flawless? It might be a little too safe if we’re trying to find a negative, but the three lads from Dublin have their style and they portray it incredibly well. A fresh sound, chiselled good looks and worldwide adoring fans to boot, The Script certainly have commercial appeal on their side. Here’s to another triumphant year in 2009.